Driving proceeds in the nonprofit fundraising sector can be a tricky business. On one hand, it’s natural to want to reach out to donors as much as possible to drive donations. But once someone has donated, you don’t want to bombard them with requests that overwhelm them and drive them away. Nonprofit teams must figure out how to drive proceeds without constantly asking donors to empty their pocketbooks and one key to achieving that, surprisingly, is fundraising gamification. What’s not surprising, however, is how engaging these programs are for donors – and how successful they are for fundraising goals. As technology has become more accessible to nonprofits, so have the abilities of fundraising gamification strategies. Today’s gamification programs are both mobile optimized and accessible anywhere at any time, making it easy for donors to join and engage in fundraising. Fundraising gamification makes charitable donations fun and social. Let’s dive in and explore all of these methods. One of the most popular forms of fundraising gamification is the scoreboard or leaderboard. Scoreboards, are digital screens or ad boards with live donation and fundraising feeds to amp up participation. They are a huge hit with donors both before and during events. Before a fundraiser, your team can install a scoreboard on your Giving Center site. This way, previous donors and attendees can see how close your nonprofit is to achieving the donation goal. Just make sure your donation goal is clearly defined and visible, as people love working towards something and celebrating when these goals are achieved. Pre-event scoreboards are also a great way to garner excitement before an event by allowing guests to preview certain auction items and showing real-time fundraising progress. Scoreboards keep attendees engaged and involved during an event so they’re tuned in to the goal throughout your fundraiser. Having a scoreboard onsite that’s steadily counting towards your nonprofit goal creates excitement and urgency that will have guests galvanized to help meet or beat your goals. To increase the sense of engagement, you may decide to separate out your attendees into ‘teams’ and assign them a name or color. This creates a fun competition between the two teams to see who can raise the most money before the end of the event. Attendees love winning just as much as they love donating to charity, so this can be a win-win for your organization! Another way to leverage fundraising gamification and technology is through event text messaging. 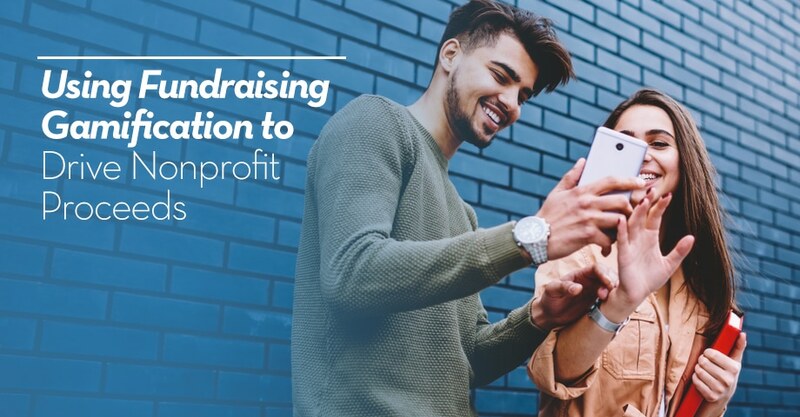 To connect and engage with donors before an event or during your fundraiser, nonprofit teams can send messages and updates through their mobile bidding and auction software to stir up interest and excitement. Sending text messages and updates helps in multiple ways. First, you remind event attendees of the sponsors, auction items, and other details about the event. Next, you can drop serious hints about your fundraising goals and the various ways attendees can donate at the event. Finally, provide attendees with an option to donate via your website to get a jump start on your nonprofit’s fundraising goal. By sending text updates, you can immediately gain the attention of your guests in the midst of competing priorities at an event. Social media is a godsend in the nonprofit fundraising world, and adding a fun gamification element really takes your fundraising to the next level. Many of your donors constantly check social media, even while at your fundraising event. There are a few ways teams gamify social media during nonprofit events. For instance, your team can set up a photobooth and ask attendees to post pictures on social media and tag the organization. Your nonprofit can engage private donors and ask them to match the number of likes a post receives on social media by donating a corresponding dollar amount. Social media is a great way to connect donors with one another and forge strong relationships around a shared interest: your charity. If your organization is interested in using gamification at fundraising events, you’ll need a comprehensive fundraising solution that covers all your bases, from mobile fundraising to back-end analytics to custom event microsites. Let OneCause help your team reach the next level in fundraising – take a test drive of the OneCause platform today!